The astonishing species diversity of New Guinea and exceptionally high numbers of endemic animals and plants are widely acknowledged, even though they are largely undocumented. This largest tropical island is among the most forested tropical countries and has also been identified as one of the major tropical wilderness areas remaining on earth (Mittermeier et al. 2003). New Guinea supports between 4 - 9% of the global biodiversity (Sekhran & Miller 1995), for example the forest flora of Papua New Guinea is one of the most diverse in the world, with some 20,000 species of vascular plants (Johns 1993). Similar high diversity applies to the arthropods, including ants. During the last 100 years many researchers have investigated the New Guinea biota during numerous expeditions to the island or as residing scientists in local institutions. In general, the flora and fauna of Papua New Guinea is better known than Indonesian Papua or New Britain. Nevertheless, today's knowledge of New Guinea insects and other arthropods is still quite basic and uneven for different groups and areas. On this website we attempt to summarize the available information about the taxonomy and distributional patterns of New Guinea ants and develop a useful framework for further research of Melanesian ants. 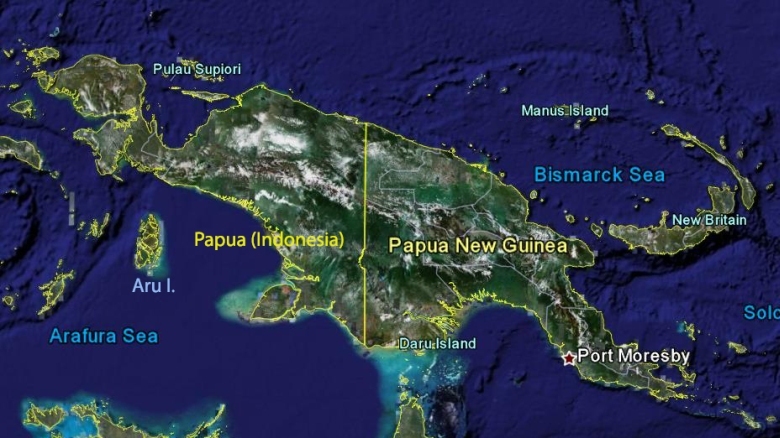 In our database and accompanying texts, we treat New Guinea as an entire island with associated archipelagos, disregarding current political boundaries. Thus we include data from islands in the Bismarck Archipelago, including New Britain, New Ireland and Manus; species records from the d'Entrecasteaux islands and Lousiade archipelago on the southeast and the Aru islands on the southwest are included as well. The western border of our target area lies behind Raja Ampat islands (Waigeo, Misool) biogeographically associated with the Wogelkopf peninsula. For an overview of the target area see map above. The New Guinea Island has a quite rich and complicated geological history. The southern part (up to the central cordillera) was attached to Australia (at least until 15 Ma ago), while the northern part is an amalgamation of more than 30 terrenes of various origins, including island arcs, pieces broken off from the Australian or New Guinean continents and in addition from parts of trapped sea floor (Turner et al. 2001). The island as a major land area is quite young, as it has emerged during last ten million years. The fragmented, insular nature of the region during the Tertiary and its topographic diversity created by the Pliocene and later uplift facilitated a rapid speciation of the flora and fauna of New Guinea. The rapid accretion of species diversity in geologically young areas has contributed to the high level of endemism. Comprehensive reviews of the geological history of the region can be found for example in de Boer (1995) and Polhemus (2007). A pictorial summary of the last 50 Ma was developed by Hall (1995) and can be found at SEARG webpage. The extant New Guinea flora and fauna is a mixture of Asian and Australian elements, with high numbers of endemic species as a consequence of its dramatic geological history. Different biogeographic relationship of Melanesian biota and affinities to adjacent areas are suggested by various authors, depending on which group is considered. Phytogeographers place New Guinea in the Indo-Malayan floral region, while distribution patterns of mammals and birds place New Guinea into the Australian region. The geographic affinities of invertebrate groups share some similarities with distributional patterns of the flora. Delimitation of endemic areas within the island of New Guinea requires additional study as several contradicting patterns emerge. At present, synthesis is difficult since few studies have examined regional biogeography within New Guinea (Miller 1996). No endemic areas could be clearly defined for the Miridae (Schuh 1984) or Lepidoptera (Holloway 1998), while five areas were recognized for cicadas (de Boer 1995, de Boer & Duffels 1996) and two for marine water striders (Andersen 1991). Conversely, numerous areas of endemism, often corresponding to accreted arc terrains, were reported for aquatic insects (Polhemus & Polhemus 1998). The Melanesian ant fauna has been usually described as an intersection of Oriental and Australian elements with an exceptionally high proportion of endemic species (Wilson 1959; 1961). However, any detailed assessment of the contribution of either biogeographical region to the composition of New Guinea fauna is missing. Here, we provide a brief overview of the biogeographic patterns for Melanesia. However as many areas of the Oriental and Austronesian regions are yet unexplored, analyses based on such incomplete species records are only preliminary. Comparison of ant fauna checklists among areas of Southeast Asia and Australia suggests that the New Guinea ant fauna is indeed very rich (nearly 900 species reported so far), with many endemic species. However, it is probably not exceptionally richer than comparative areas such as Borneo or Philippines. At least 545 species appear to be endemic to New Guinea and the Bismarck Archipelago (but no new described genera so far). If we would consider only the New Guinea mainland, without adjacent archipelagos, then there are 559 known species reported. The New Guinea ant fauna has its strongest affinities to Australia, with which it shares the highest proportion of species and genera (of the 85 genera in New Guinea, 89% are shared with Australia), as well as part of its geological history. The majority of overlapping genera (76) occur within tropical Northeast Australia. Also a high proportion of species and genera are shared between New Guinea and Philippines (69 genera, 80%), which suggests either some common ancestral area or rather utilization of a dispersal route created by island arcs. Many genera (73, 85%) are also shared between New Guinea and the Southeast Asian islands (Borneo, Sumatra, Java) when their species lists are pooled together. However, there are only two genera shared between the Oriental region and New Guinea which do not occur in Australia at the same time. A significant proportion of the ant fauna of Southeast Asia and Austronesia is composed of widespread genera (those which occur in at least four main biogeographic regions), which often represent a major component of island faunas. Widespread genera are also an important element (51%) in the New Guinea fauna. Areas east of New Guinea and Australia are inhabited mainly by such widespread genera with smaller proportions of Oriental and Austronesian taxa. Widespread genera occurring in New Guinea represent from 98 to 100% of the entire fauna in Polynesia, Fiji, Vanuatu and the Solomon Islands. The island fauna along the border between the Oriental and Austronesian regions appears to be a mixture of elements from both areas; however, Oriental affinities seem to prevail. At the same time, a considerable proportion of the Southeast Asian and Austronesian fauna consist of genera distributed uniformly across the whole region, with the centre of their diversity on Oriental and Melanesian islands. Ant generic similarity among Austronesian regions and adjacent biogeographical areas. Delimitation of biogeographical areas of SE Asia and Austronesia and their generic overlap with New Guinea. Similarity is expressed by the percentage of ant genera which a particular area share with New Guinea. Percentage similarity roughly corresponds with similarity based on Sorensen index which also considers actual size of fauna of compared area. Comparisons are based on distribution data for the 136 ant genera. Positions and delimitations of Afrotropical, Nearctic and Neotropical areas does not reflect their actual geographic positions and division used in analyses, but are included just for displaying the faunal similarity.